I have some aubergine/eggplant in the fridge , leftover from making the aubergine omelette a few days ago. 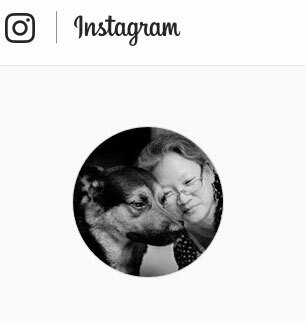 I will be cooking simple for another few weeks....my tennis elbow still gives me the ache :( anyway, we still need to eat and eating out most of the time is not good for me. I still have to cook light dishes for our dinner . 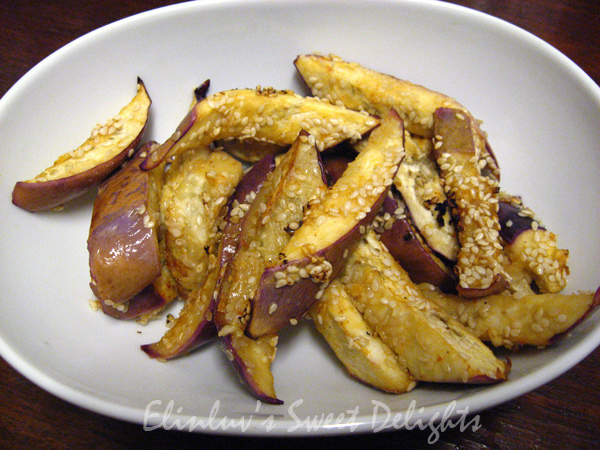 I googled for eggplant dishes and I came across Martha Stewart's Spicy Sesame Eggplant and I got bewitched by it. This is a dish that will have you eating non stop...it is spicy , tangy and aromatic. 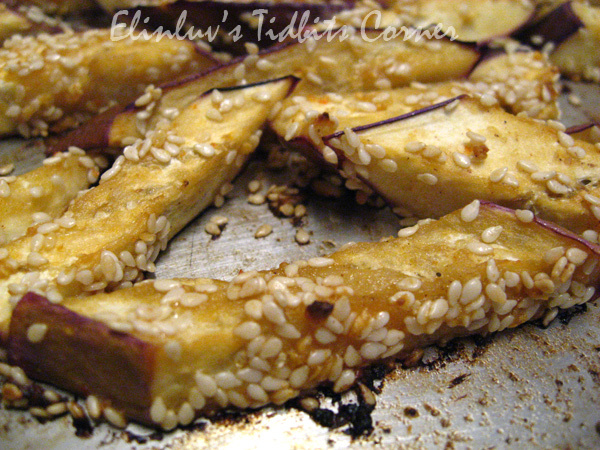 The sauce that coats the eggplant strips is so flavorful that when you put on strip on your tongue, you could immediately taste the flavors of garlicky hot chilli , the sharp tangy lime juice and the aromatic sesame.....the combination of these flavors made the eggplant addictive ! Love it and I think for people who loves eggplant, you will definitely love this preparation :) Do read on for the recipe taken from Martha's website. Heat broiler . 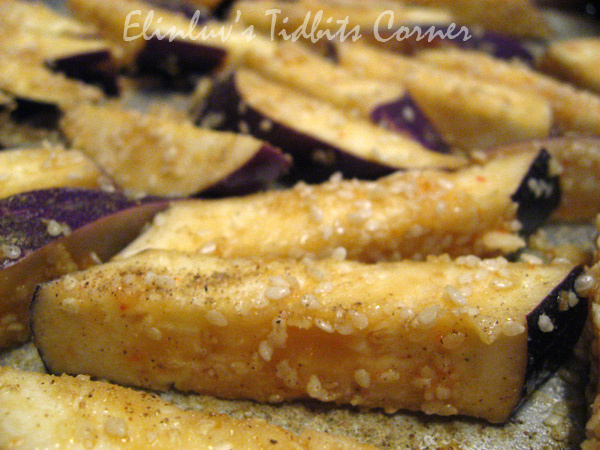 Slice eggplant into 3/4 inch rounds, cut each round into 3/4 inch wide strips. Transfer to a broiler proof rimmed baking sheet, toss with coarse salt and ground pepper. 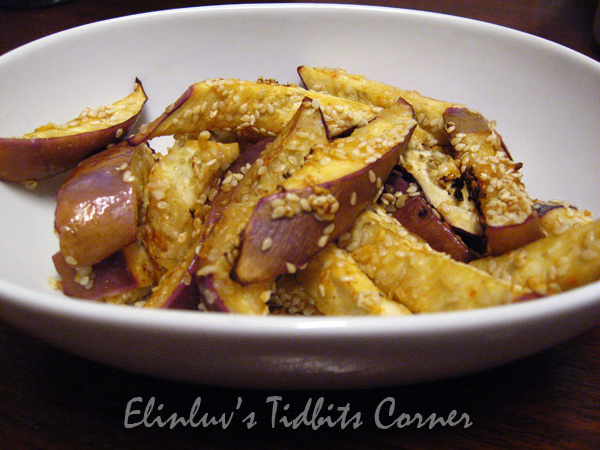 In a small bowl, combine sauce ingredients, drizzle over eggplant, and toss to coat. Spread in an even layer. Broil, tossing once, until eggplant is browned and tender, about 15 minutes. Quick, easy and delicious! I know I will love it. I gotto make this for my Quay Lo. He is a big fan of eggplants.